Very spacious tent that can be opened on 3 sides. Modern and comfortable furniture. Stunning views on the savanna. Kicheche Valley is located within Naboisho Conservancy. The camp is set on the eastern side in a beautiful secluded valley dotted with acacia trees and is completely unfenced. The tents lie amongst the trees and rocky outcrops and enjoy wonderful views of the game filled plains to the south. The location is close to both the Eniskeria river region, with its stunning granite outcrops and permanent pools popular with the resident wildlife, and the vast plains to the north hosting large numbers of plains game and containing a vital elephant corridor to the north. The valleys to the west provide a scenic backdrop whilst game driving and are ideal for game walks. 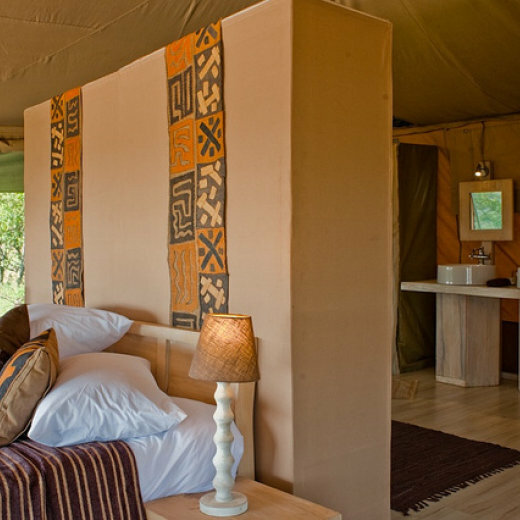 Kicheche Valley Camp has six luxury canvas tents accommodating 12 guests. Each tent is spacious, fully insect-proof and equipped with large beds, bedside tables, luggage racks, lounge chair, desk and rugs. Bathrooms are en suite and are equipped with a dresser, shower, flushing toilet and running water. Triple bed configuration is available on request. All meals and drinks are inclusive in your stay and taken alfresco in an area overlooking the plains or, in the event of bad weather, in the spacious dining tent. The cuisine is Western/European with occasional African dishes and hygiene standards are high. The camp can cater for special dietary requirements. Mineral water is provided in each tent every day.